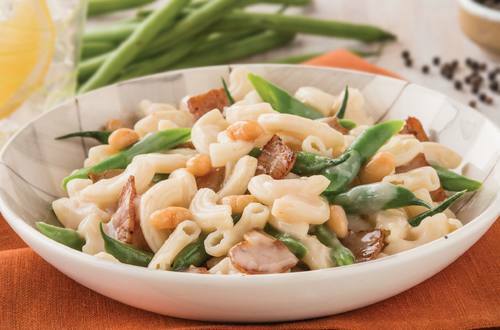 Do something different with macaroni and try our bacon and bean macaroni recipe, part of the Continental recipes collection. Ready in just 20 minutes and serves 3-4. 1 Heat olive oil in a large saucepan or fry pan and brown bacon. 2 Add Pasta & Sauce, milk and water and beans and bring to the boil. Simmer for 10 minutes, stirring regularly. 3 Stir through baked beans a few minutes before the end of cooking.